Art Supplies! Image via flickr user Grace Kat. Happy National Arts in Education Week! According to the NAEA, “Congress designated Arts in Education Week to promote and showcase the immense role arts education has in producing engaged, successful, and college and career-ready students.” Amen to that! There has also been plenty of arts ed-centric celebrating happening on the internet this week--over at ARTSblog, Americans for the Arts is celebrating with an Art Education blog salon on the topic of “Career Development for Students and the Role of Arts Education.“ As I followed along with the salon this week, I was excited to make a connection between the topic and a terrific article about a student in Kentucky working to help art educators in her community. Read on to find out about a remarkable fifteen year old whose accomplishments bode well for the next generation of art advocacy. The story goes something like this: Virginia Newsome, a fifteen-year-old student at the School for Creative and Performing Arts in Lexington, KY, took notice of budget cuts to arts programs at her own school. When challenged to create a community based project for a Youth Leadership conference, she realized that if her school, an arts school, felt the impacts of shrinking budgets on arts funding, arts programs must be suffering even more drastically at traditional schools. Thus, heARTS was born. 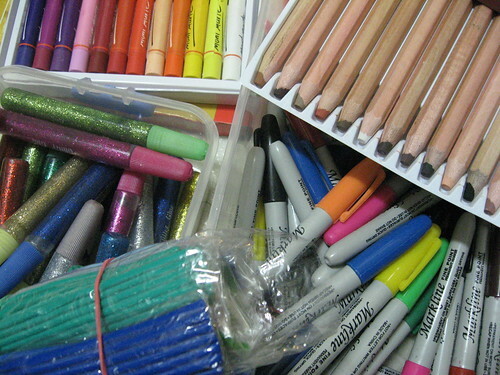 heARTS accepts requests for school supplies (via the organization’s website) from art teachers in Kentucky and beyond. For heARTS’ first supplies collection, Virginia and her volunteers collected 266 markers, 128 glue sticks and 1,200 crayons; teachers can request musical and theater arts supplies as well. According to the Lexington Herald-Leader heARTS is also working on getting in the advocacy game, designating a classmate to create a presentation designed to fight arts cuts at the school board level. "We want to explain how arts can raise test scores, they help discipline issues, help time management," Virginia told the Herald-Leader. "Even if you don't want to go into the arts as a profession, they (the arts) can be helpful, in any way shape or form." Since Virginia attends an arts high school, I’d say it’s fair to guess that she has had access to art education throughout her educational career, at least to some extent. Aside from being a proactive go-getter it’s obvious that she knows how to problem solve and think outside the box--two skills that businesses want from new hires (per Newsweek’s now infamous Creativity Crisis story). Indeed, those issues have been coming up again and again over at ARTSblog’s Art Ed blog salon. Virginia is a terrific example not only of practical applications of creativity but also of a grassroots advocate. heARTS responds to educators needs by filling their requests directly--an effective way of helping art teachers, well, teach. And there is certainly a demand; Virginia told the Lexington Herald-Leader that she has received requests from as far away as Hawaii and even Africa! (Looks to me like we have a new arts education advocate poster girl.) The heARTS model could also be replicated in other communities, effectively helping art teachers and art students far and wide. Aside from all this, heARTS is just getting started--who knows what great things Virginia and her organization might accomplish in the future! Have you seen anything like heARTS in your community--and if not, would you want one? (Materials for the Arts here in New York City is like a big free thrift store for artists and arts organizations--not unlike heARTS.) And have you celebrated Arts in Education week? Maybe every week is Arts Ed week for Art Advocado readers....! P.S. Check out heARTS on Facebook here!